Today, we tackle social media… specifically – how to improve and enhance your LinkedIn profile. Use a good personal photo. Notice, I didn’t say ‘great’… ‘good’ is fine. Don’t worry about hiring a professional photographer (though, if you want to, that’s OK)… just have someone use their iPhone to take a good, clean picture of you at your desk or outside of your office building. And please, please, please… get rid of the silly pics, the vacation pics and the party pics. New clients will only do business with a new vendor when they’ve reached a certain ‘trust level’… and a LinkedIn picture of you swilling a cocktail doesn’t help! Complete the profile. Your LinkedIn profile is essentially an online resume… why wouldn’t you make sure it’s complete? Take a few minutes to list all of your employment history (with details – just like on your resume) and educational background. And make it easy to get in touch with you and learn more about you… make sure to list your email address(es) and other social media sites, too. Republishing your writing under ‘Posts’… and access to them is viewable “above the fold.” From the day they opened up this functionality, every post I’ve ever written for my blog has also been published on my LinkedIn profile. It extends the reach of who can read it. 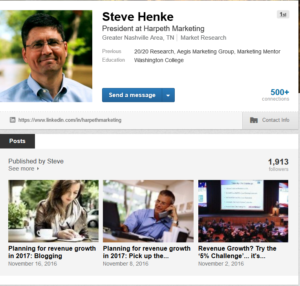 In fact, for many of my posts – I get more readership on LinkedIn than on the blog itself. Further down on your profile is the ‘Publications’ section. Here, you can provide access to the larger documents you’ve authored – eBooks, PowerPoint presentations, white papers, etc. Engage. You have two direct opportunities to engage with the marketplace – by ‘connecting’ with other professionals and by ‘joining’ targeted groups. You need to do as much of this as is appropriate (though, it’s still a quality over quantity activity). If someone has a high number of connections and is a member of a lot of [the right] groups, it shows they do more than just work in an industry… it shows they are involved in it and serious about it. Skills. One of the ways that professionals can provide a certain level of ‘proof’ to their background is by the number of people who recognize you for proficiency is specific skill areas. The idea is that people who are familiar with your work can recognize you for those skills (and in return, you can do the same for them). Remember, this LinkedIn profile is YOUR profile – not your company’s. Yes, it certainly can benefit your employer… but it’s also a tool for helping you with your career—so take a few minutes to make it as great as it can be.